What is a PLC. Who uses them and what for? Learn how to program! Don't settle for what's around, customize PLC learning to how you want it, go on have your say! "What’s one of those?" I hear! These little beasties are basically a computer. Even the smallest PLC has a microprocessor, that qualifies it as a computer. Yes a computer, but not in the generally accepted (home PC) form, they are what you would term as an industrial computer. Built to withstand very harsh environments. Find out what makes a PLC tick and how they work. Their appearance (of the smaller ones at least) is rather nondescript as most look like a smallish box with rows of screws on top and bottom. This is because they are manufactured to withstand harsh environments and be very reliable performing its programmed task (or tasks). They don't have a mouse, keyboard or even a screen, they don't even talk the same language as a PC. Of course ultimately all computers use binary when running a program, but saying language I'm referring to programming, this is how humans program them to perform a task or tasks. The outputs (real world switches) are switched on and off according to the program, which in turn can be effected by the input (real world signals) conditions. This is basically how PLC''s can perform automated operations and tasks without human intervention. 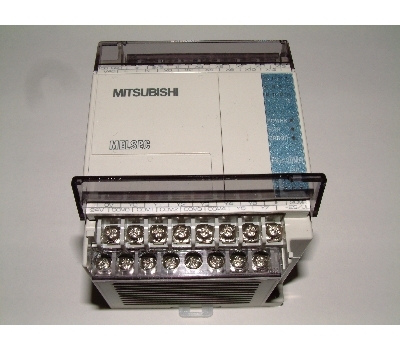 In the picture, above at the top, is a Mitsubishi FX1S-20MR, the 20 stands for the amount of inputs and outputs, in this case 12 inputs and 8 outputs. The 'FX' is the (Mitsubishi) family of PLC that it belongs to and the '1S' part is its model type. - BTW - Just for your information, the abbreviation PLC and the term 'Programmable Logic Controller' are in fact registered trademarks of the Allen-Bradley Company, although nowadays they are widely used as a generic description. A Programmable Logic Controller is a device that a user can program to perform a series or sequence of events. These events are triggered by stimuli (called inputs) received at the programmable logic controller through delayed actions such as time delays or counted occurrences. Once an event triggers, it actuates in the outside world by switching on or off electronic control gear or the physical actuation of devices. A Programmable Logic Controllers will continually loop through its user defined program waiting for inputs and giving outputs at the specific programmed times. As you would imagine in the world of computers they have their own language. This language is used to program the Programmable Logic Controller can be used in three formats, ladder, instruction list and logic symbol. More about this a bit later on. Programmable Logic Controllers first came about as a replacement for automatic control systems that used tens and hundreds (maybe even thousands) of hard wired relays, motor driven cam timers and rotary sequencers. More often then not, a single PLC can be programmed to replace thousands of relays and timers. These Programmable Logic Controllers were first befriended by the automotive manufacturing industry, this enabled software revision to replace the laborious re-wiring of control panels when a new production model was introduced. Many of the earliest Programmable Logic Controllers expressed all decision making logic in a program format called Ladder Logic, which from its appearance was very similar to electrical schematic diagrams. This of course was perfect for the electricians of the day, whom quite able to follow and trace out circuit problems with electrical schematic diagrams. So using ladder logic became second nature to them allowing the electricians an relatively easy transition from hard wired circuits to software driven circuits. This is the reason this program notation was chosen, to reduce training time for the existing technicians. Other early Programmable Logic Controllers used an instruction list type form of programming, based on a stack-based logic solver. Which was far most difficult to master. A program is a connected series of instructions written in a language that the Programmable Logic Controller can understand. There are three forms of program format for PLC’s these are Ladder, Instruction and SFC/STL. Not all programming tools can work with all programming formats. Generally hand held programming panels only work with instruction format while most graphic programming tools work with both instruction and ladder format. Specialist programming software will also allow SFC style programming but that’s for another time. We will only be concerning ourselves with Ladder Logic programming here, because it's the most widespread in use today, probably because it's the easiest to grasp and get into the quickest. Now, there's one big difference between a PLC and a PC type computer; as mentioned above, they only have one program to run. Unlike the PC, which is capable of running several programs at once within the Windows framework. Any of these could one or many many more of the different programs that could be installed on the PC. Why? In one word, speed. A PLC will be designed to run its one program at a very fast speed, only branching out from within the main bit when an event happens. Events that happen in real time. This gives our little PLC beastie the ability to respond very quickly to any of the events under its control via an input. Its response would then be carried out via an output. For example controlling a machines production running at 30,000 units an hour! Such as an offset web printing press churning out newspapers or book pages. Ladder Logic, (the PLC programming language) is very closely associated to relay logic. In relay logic there are both contacts and coils that can be loaded and driven in different configurations. As there are in ladder logic, but a lot more configurations are possible. However the basic principal remains the same. The program is written to switch the desired outputs for a given set of inputs energized. The 'hello world' program equivalent for a PLC would be a light bulb and a switch (see below). The switch is the input and the bulb would be controlled by the output. So, when the switch (input) is on, the bulb (output) is on. A coil (relay logic terminology) drives outputs of the PLC (a ‘Y’ device, e.g. Y01) or drives internal coils (‘M’ device) timers, counters or flags. Each coil has associated contacts. These contacts are available in both normally open (NO) and normally closed (NC) configurations. The term normally refers to the status of the contacts when the coil is not energized. Using a relay analogy, when the coil is off, a NO contact would have no current flow, that is, a load being supplied through a NO contact would not operate. However, a NC contact would allow current to flow, hence the connected load would be active. Activating the coil reverses the contact status, that is, the current would flow in a NO contact and a NC contact would then inhibit the flow. Physical inputs to the PLC (X devices) have no programmable coil. These devices may only be used in a contact format, again with NO and NC types available. Because of the close relay logic association, ladder logic programs can be read as current flowing from the left vertical line to the right vertical line. This current must pass through the input (switch) configuration in order to switch the output coil Y0 on. Therefore in the example below, switching X0 on and X1 being off would causes the output Y0 to also to switch on. However, if X1 were to switch on while X0 was on, the output coil would then switch off. This is a very basic example of course, as they are very capable of automating a complete warehouse or running very complex machines on their own. Then, as you would imagine, the program it would be running would have many twists and turns to respond to the 10's and quite possibly even 100's of inputs and outputs. These inputs in conjunction with the program would be dictating the on and off pattern of the outputs at any given time. Here are just a few examples of Programmable Logic Controller programming applications that have been successfully completed and are in use today. As I said these are just a few examples of plc programming applications, there are many many more in use today. In point of fact, there are far too many to list here, the PLC is today's unseen hero controlling a massive range of equipment. Manufacturers such as Mitsubishi, Allen Bradley, Omron and Siemens have been around for a long time and produce very high quality equipment through years of development (they should be paying me for advertising). It is quite probable that your machines have one of these makes controlling it. So spare a thought for the Programmable Logic Controller as you journey through this site, it does do a lot of work and it doesn't get out much! OR chose another main section to go to!